Guide for configuring connections to LDAP servers. You can configure multiple LDAP connections and you use these connection from other guides/configurations. Start the guide by clicking on the '+' sign next to the LDAP menu item. Use previous and next to navigate through the steps in the guide. You can choose to cancel the guide at any time (information entered will be lost). Name your connection and give it an optional description. Name will be displayed when other guides prompts for a connection. Specify the host and port of the LDAP server. Host can be a hostname, an IP or a DNS name. To enable failover on the connection, comma (',') separate multiple hosts. If the failover servers uses the same port, you only need to specify port once. If not, specify ports comma separated for each host in the same order as you specified the hosts. Specify credentials for the connection. Specify if the connection should be encrypted and use SSL/TLS. This option requires SSL/TLS to be enabled on the LDAP server. To establish trust between the PhenixID server and the LDAP server, the LDAP server SSL certificate chain must be added to the PhenixID server trust store managed by the Java Virtual Machine PhenixID server uses (bundled). This is an advanced administrative task not covered by this documentation. To skip trust check between PhenixID server and LDAP, enable 'Trust all'. Before you create the connection you can test current settings. If the connection test fails, step back in guide and adjust your settings. It is possible to create a connection even though the connection test failed. 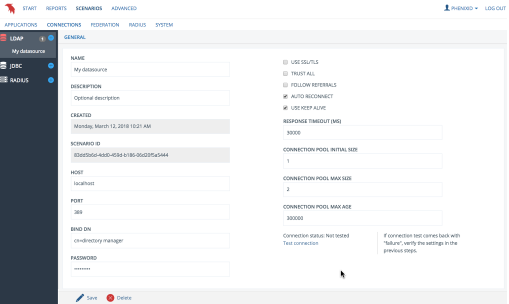 Note: Connection test is performed from the actual backend PhenixID server instance (or cluster) that is running the Configuration Manager application and not from your local machine. Review your configuration and click 'Create' to create the connection. The connection will be available when the guide has completed. To edit a connection, select the connection in the lefthand menu. Note: Changes are hot. When you save, the server will reload and apply your changes immediately. In the LDAP connection edit view you can change all settings on a connection (including properties not displayed in the guide). When done editing, click 'Save' to save your changes. To delete the connection, click 'Delete'. Note: Make sure that the connection is not used by any configuration before you delete it. If you remove a connection that is in use, you will brake the configuration and the server will not work as expected.